FDE: These posts, with a simpler cap, have now been added to the Flora & Fauna collection. What sort of home would these posts look best in? Scott: These posts would look wonderful in either a contemporary or traditional home. 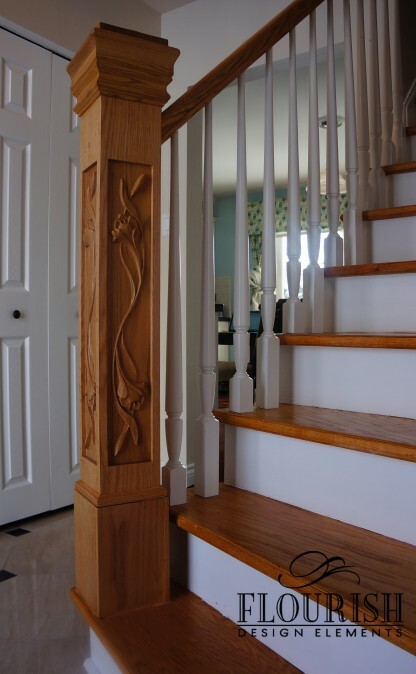 Custom carved newel posts are a great way to add visual detail to an otherwise simple-looking stairwell. 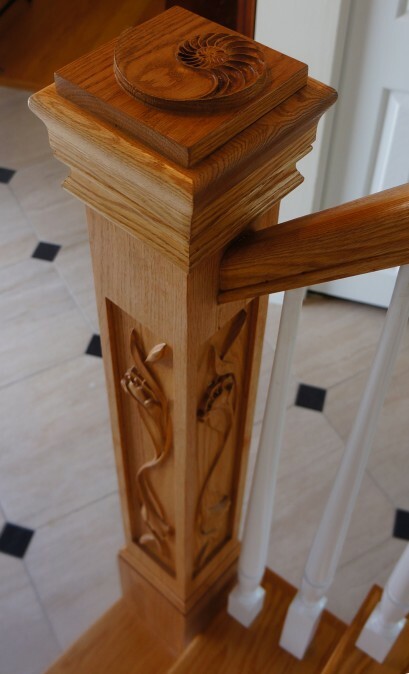 FDE: Do you have any advice for someone who is thinking about having a custom carved newel post designed for their home? FDE: Tell us about the Crocus Newel Post. Scott: The Crocus newel post began as a custom commissioned piece for homeowners in Ottawa. They were looking for a newel post that would reflect their own tastes and personalities. It was very important to them to be able to put their own stamp on their home. FDE: What was the design process? Scott: The homeowners began by sending me pictures of special items that they wanted to incorporate into the post design and we tailored those images to fit onto the post face. We went through several revisions and in the end we had created a design featuring those images in a manner that would suit the space in a tasteful and elegant way. The sides of the post feature a double-edged crocus and the cap of the post features a nautilus shell. To see more pictures of the Crocus Newel Post, check us out on Houzz!